Any planet is “Earth” to those who live on it – especially to those who are stuck on it. I’m really excited this week, because the book I’m featuring is one of my favorites, and it’s a story that’s close to my heart. 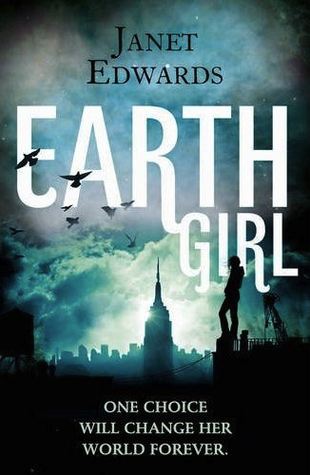 Set in the far-flung future, Earth Girl follows the story of an eighteen-year-old girl named Jarra who is among the one-in-a-thousand born with an immune disorder that confines her to earth’s atmosphere. Humans have developed portal technology at this point, using it to colonize a multitude of worlds, but unfortunately Jarra can’t visit any of them. If she even stepped onto any of those planets, she would go into anaphylactic shock in seconds and die if not returned immediately to Earth. Those afflicted with Jarra’s condition are looked down upon, and called all kinds of terrible, hurtful names. Jarra is sick and tired of it, so when the time comes to enroll in university, she decides to invent a fake background for herself to apply at a school on another planet whose class would be on earth for the first year of practical studies. Time to show the universe just what a mere “Earth Girl” is capable of, and to take a look at the book covers! No contest here. I’ve waited a long time for this week’s topic to come up because I’ve always had this book in mind to feature for it. I adore this novel and I’ve always loved, loved, LOVED the Pyr cover – and not just because it’s downright stunning! I also like the image of the girl’s ankle shackled to the Earth-and-chain, symbolizing Jarra’s dilemma of being confined to the planet because of her immune disorder. 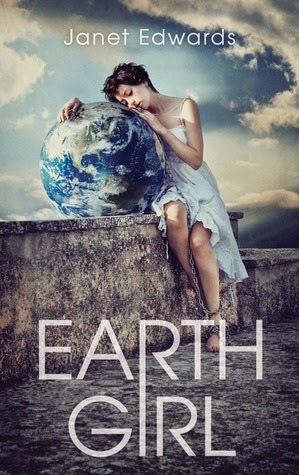 At the same time, she is embracing Earth because it’s the only home she knows and it’s the home she loves. This is a great cover for so many reasons, any of which would have been enough for me to choose it as the clear winner. Oh they’re different but I really like them both! Agreed, great use of colors on both! I liked the first cover as soon as I saw it, except for the font which I’m not overly fond of, but then I scrolled down and saw the second cover which is so lovely. The pose is so striking, almost lovingly forlorn. Brings a whole new meaning to the ball and chain phrase, clearly she’s married to the planet. I like both covers but for some reason, without reading the synopsis or knowing anything about the book, I’d be more apt to grab the first copy. After learning more about it, the second one is quite fitting as well. I don’t think you can really lose with either! Good point. In a wah I think the photo-realism of the second novel actually kind of hurts it a bit, since it gives off the impression of being an “artsy” book. Indeed, I love the color palette for both covers. The first one blends the greens, blues, and purples so well! So that IS a ball and chain manacled around her feet! I wasn’t sure, but your description of the Pyr cover confirmed it. I pick that one, too. Love all the symbolism that’s going on there. Yep, it’s a ball and chain! I remember the moment I finally noticed! I must have had the book for months at that point, and when I finally caught that little detail, I had myself a facepalm moment. I like that cover the best too. It’s kind of awesome actually. I like both covers, but that second one is head and shoulders above the other one. the shackles are a nice touch too. Wow, I’ve never heard of this book but it sounds amazing! I love the premise. Will definitely be adding it to my to-read list. As for the covers, they are both beautiful… if I had to choose I might lean toward the left side one, simply because I love the colours, font and the cloudy silhouetted look… but the other one is brilliant too!